Many regions in India have long traditions of vegetarianism, so it’s not difficult to find vegan Indian recipes or vegetarian recipes that are easily veganizable. Tofu can be substituted for paneer (homemade cheese), and oil or margarine can be used instead of ghee (clarified butter). But what do you do when you want to cut out the oil and margarine completely? As it turns out, it’s usually very easy to make Indian food without added fat. The main trick is to toast spices without the tablespoon or more oil that is usually called for. Often, recipes ask you to fry cumin, mustard, or other seeds in oil until they pop, releasing their flavor into the oil. If you don’t mind using a little oil, as little as 1/8 of a teaspoon can be used to fry the seeds. You can use even less oil by giving the pan a quick spray in one spot in the center and then toasting the seeds in the spray for about a minute. You might not be able to get the seeds to pop, but you will increase the flavor they release. Be very careful not to scorch the seeds or they will be bitter; stop after a minute or when they release their aroma. You can also toast the seeds in an unoiled pan alone or while browning onions. Add the seeds near the end of the onions’ cooking time and be very careful not to let them cook too long. Ground spices can usually be added directly to a dish without toasting, but some blends, such as garam masala, are toasted in a dry skillet before using. 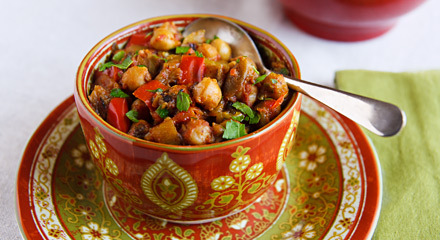 There are over two dozen Indian recipes on the FatFree Vegan Kitchen blog, including Eggplant and Chickpea Curry, pictured above. Check them out! Thanks for the tip on cooking without oil.its really useful for cholesterol patients. What about water-sautéing? Would that work to toast the seeds without oil as well, or would that not work? Thanks for this tip about using less oil.